Welcome back to the big leagues, M. Night Shyamalan. Throughout the tumultuous career of the once promising director, the Tiger Woods of filmmaking, Shyamalan has had his fair share of high points and lows. All of them rightfully earned by the end product. It can sometimes seen unfathomable that the same man who crafted one of the last spoiler free movies before the ushering in of the information age in The Sixth Sense and one of our most grounded and humanized superhero stories in Unbreakable was responsible for The Lady in the Water and The Last Airbender and After Earth. It’s been a trivial pursuit of chutes and ladders. But finally with The Visit, Shyamalan has gotten his groove back, doing what he has done best over his career. Even his bad films have had decent twists; they’ve just been anchored by stories written without care. 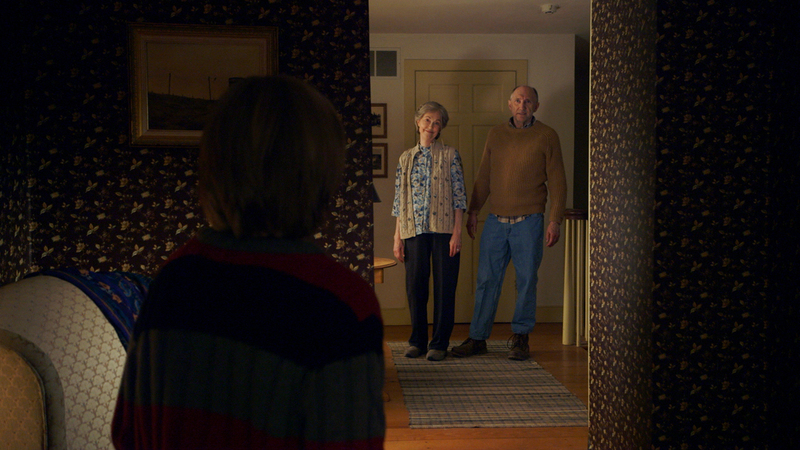 The Visit reminds us of his talent, in ways both good and bad. Shyamalan has endured in the film community what is equivalent to the hate Macklemore has experienced in the music circle. Both are recognized as talents; both are seen as emphatically overhyped. But in both cases you have to get to each respective artist’s deep cuts to find their creative voices. 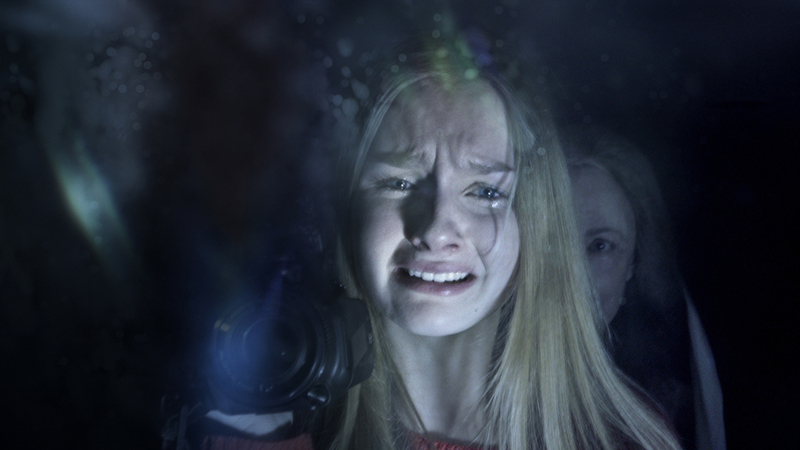 Shyamalan does something new here, in that he mixes comedy with horror. It’d feel like a Joe Dante film If there were little creatures scurrying about. You’ll be surprised by how funny the movie is, and even with the tiring first act, which is absolutely worth sitting through, you’ll be satisfied by the ending. We know that the twist is coming. It is inherent with his style. So with a pace this stilted and a plotline this basic, it’s surprising where Shyamalan is able to take us. You can always find something new as long as you’re willing to look from a new perspective. Siblings Becca (Olivia DeJonge) and Tyler (Ed Oxenbould) want to give their mother (Kathryn Hahn, again showing us she deserves better roles) a break away from her life as a Wal-Mart sales associate. She’s set for a cruise with her boyfriend; the kids get to spend a week with their grandparents. They’ve never met them, never heard their voices or seen their faces. Their Mom left the nest in an ugly way, an 18-year-old starting a life with the man who eventually left her, and it’s a hidden past full of guilt. No communication with them since. Becca is an aspiring documentarian who hates her father and Tyler is a young rapper coping through rhymes. So when they meet their Nana (Deanna Dunagan) and Pop Pop (Peter McRobbie), both giving disturbing performances, it’s safe to assume what unfolds doesn’t match their expectations. 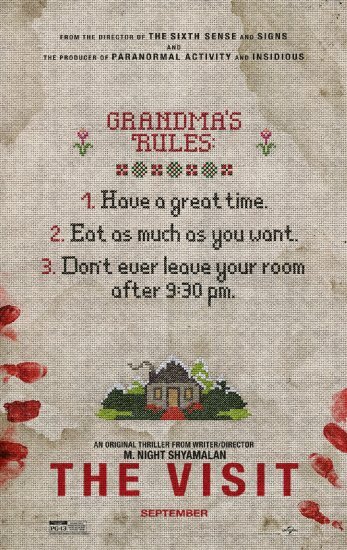 The Visit starts in a cumbersome way, straight forwardly told as a direct reply by Shyamalan to his haters. He vicariously speaks to us through Becca with dialogue full of filmmaking terms, and it’s so overdone that I’m afraid it’ll make most audiences shut off. As a critic, I know the language, and I can see it from the reverse side as well that it is monotonous. “Okay, M. Night, you know your stuff. We get it.” The Visit is a problematic vacation, starting with a dull layover and transitions towards a routine flight. The destination though, that deliriously tense climax, delivers genuine chills. All of Shyamalan’s films revolve around thematic family issues, and this time it is the importance of forgiveness. The Visit tries to do too much. Fewer miles tests less patience. Yet with the wide-angle lenses and the properly placed found footage shots, we’re put in the story as well as pushed back, forced to see the bizarre nature of what’s to come. Shyamalan hasn’t made a great movie here, but he’s made one with a full circle sense of sincerity, with laughs and scares and carefully plotted thought. The Visit has the goods; now only if he didn’t have to tell us.